When Will the Oscars Get It Right? Toughest Pawnee: [speaking Pawnee; subtitled] Only a white man would make a fire for everyone to see. Pawnee #1: [in Pawnee] Maybe there's more than one. Pawnee #2: [in Pawnee] There may be three or four. Toughest Pawnee: [in Pawnee] I know three or four who will not be making the trip home. Q: When John Dunbar is sent to Fort Hays after his suicide attempt, his superior officer says to him, "I have just pissed in my pants and nobody can do anything about it." What does he mean by that? Q: Why did Lt. Dunbar and Stands with a Fist leave the tribe? A story of a lost way of life. 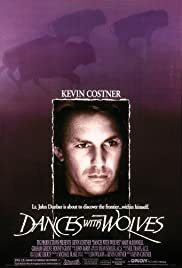 When I first saw the movie Dances With Wolves several years ago the story affected me in a heavy way, so much so that I decided that it would be a long time before I watched it again. The story is not entertainment. It is a lesson. Last week I watched the movie again with a new understanding. Many of the published reviews seem to dislike the movie for various reasons. They are the ones that missed the point of the story. The story is, of course, fiction based on a novel by Michael Blake. Fortunately, Michael Blake also wrote the screenplay for the movie insuring fidelity with his vision. To the credit of Kevin Costner, who was one of the producers and the director, he allowed the story to be what Michael Blake had originally created. Costner showed great sensitivity in not only capturing the personalities of all the major characters, but making the land itself (in this case South Dakota) one of the major players. The land was not just a backdrop or playing field. It was the main character and very much alive. The cinematography was some of the best I've ever seen and in the tradition of the great movie director, John Ford. Ford had an ability to present the land in all its beauty, which also just happened to have a story occurring on it. 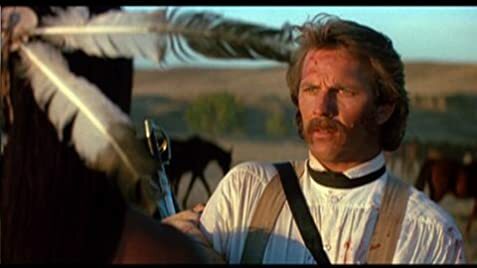 In Dances With Wolves, the land of South Dakota might initially appear to be a bleak place, but as Lieutenant Dunbar (Costner) spends more time at his isolated fort, he somehow slowly merges his soul with the surrounding territory. The life on the land eventually stumbles onto his location, including a wolf and a tribe of Sioux. The Sioux and Dunbar mistrust each other initially but through curiosity learn how to communicate with each other, however painfully slow. The wolf too was curious about the soldier, but kept his distance for a while. Finally, the wolf trusts Dunbar enough to play with him on the prairie. The Sioux see them playing. Here was a white man not killing the animals. He had earned a new name: Dances-With-Wolves. The main difference between this movie and a John Ford movie was the way Costner humanized the Sioux characters. In a John Ford movie, most Indians were the enemy. The only 'good' Indians were the cavalry scouts, but we never really met these scouts as people. John Ford hired Navaho people to play the parts of Indians in his cavalry trilogy, Fort Apache, She Wore a Yellow Ribbon and Rio Grande, which were filmed in Monument Valley on the Navaho Reservation. Years later, Ford attempted to humanize the Native Americans in a movie called Cheyenne Autumn, but by then Ford was an old man and had lost most of his creative genius. It is a hard movie for me to watch. Costner's movie takes great pains to allow us to know the Sioux characters. The story is about them as seen through the eyes of a perceptive white man, who had been given a new life by the gods when his attempt at suicide ended with his recognition as a war hero. What I see when I watch the movie: I see ten thousand years of evolution and experience of a human tribe on the North American continent with the most recent characters at the leading edge of the current (1860) time. The character's lives are so well presented that I sense the history of their past In other words, I understand why they do what they do. What depresses me about the movie is that I know the ending but the characters don't. I know that their natural way of life is coming to an end. The characters don't know. To me, the movie is a story of the 4 billion, six hundred million years of natural evolution which is about to meet technology. Technology will be as devastating to this tribe and the land as if an asteroid had hit the earth. The beauty of the Sioux life is so precisely shown in this movie. Their everyday routine of just living off the land is seen the same way as a buffalo eating the grass. The Sioux adapted to the land the way it was. You see the grass move in waves like the ocean does when the invisible winds touch the surfaces. You see the effects of the same winds that blow across the face and hair of Stands-With-a-Fist. You hear the same winds. The same winds take the smoke from the lodges away from the village. The land and air and life merge in a poetic movement. The horses seem more natural and free in their herd next to the village. They are part of the tribe. You can see the magnificence of the Sioux riders as they become one with the horse as they hunt the buffalo. I suppose, in a way, the horse was a step in technology for the Sioux since they didn't have the horse until the Spanish Conquistadors brought them. But when they adapted their life to the horse, they became a great people. I look at it as a step in evolution, not a step in technology. We find that the holy man, Kicking-Bird, played by Graham Green, was a hen-pecked husband, something we can all identify with no matter what race or ethnic group. His wife saw more than he did, especially the budding love between Lieutenant Dunbar and Stands-With-a-Fist, who was played by the heavy-duty stage actress Mary McDonnell. She is important to our story because we understand the Sioux from her translations. As an actress, she was so convincing in her struggle to remember long forgotten English words from her childhood, from the time before she came to live with the Sioux. Kicking-Bird on the other hand represented the soul of the Sioux People. He was patient and was the type of person you would want as a friend. We have Rodney Grant playing the part of Wind-in-His-Hair, the warrior who was quick to anger but was smart enough to listen to his elders and not kill the white soldier. Rodney Grant represented the beauty and pride of the Sioux People. He speaks the last relevant words in the story by proclaiming that he is the friend of Dances-With-Wolves. Before Dunbar became Dances-With-Wolves, Wind-in-His-Hair would have been happy to kill him. `Red Crow' Westerman played the part of the chief, Ten-Bears. We've seen him play the part of a shaman in other movies. He represented the wisdom and of the Sioux People and was also their prophet. What movie about Native Americans could be told without Wes Studi? In this movie he plays the enemy Pawnee so convincingly that you really hate him. Not only is he the enemy to the white man but the Sioux also. Wes Studi can be very intense in his savagery, but in the eyes of the Pawnee, he was only protecting his tribal interests. So we see the Sioux and, to a lessor degree, the Pawnee in their soon-to-end natural states. We immediately feel at home with the Sioux. The Pawnee aren't quite as lovable, especially when we see Wes Studi scalping the muleskinner. The first disturbing scene is when the Pawnee attack the Sioux village and we see that to save themselves, the Sioux need the technology (the rifles) of the white soldier. The Pawnee were so fierce looking (again convincingly by Wes Studi) that we fear for the Sioux tribe but see that the rifles are out of place in this natural world. It is another technological step in the same magnitude as the horse. But for all their beauty and greatness, we know they cannot win the final battles with the white civilization because they are so grossly outnumbered. There is the core of the problem. The over-population of the modern civilization overruns their own land so they come to the land of the Sioux and destroy without asking. You could see it in the face of every tribal member as they walked past dead and skinned buffalo which were left to rot in the sun after the buffalo hunters had skinned them for their hides. They were absolutely stunned and sick at the sight. Whoever did this had no soul. I extend the message of this movie to today and see population running amuck, stripping the land of resources and changing the atmosphere. It is too painful to contemplate. To emphasize the loss and waste of the beautiful prairie life, near the end of the movie we see the soldiers shooting at the wolf for fun. The wolf is confused and doesn't understand that bullets are hitting near him. Eventually a bullet strikes the wolf and we hear him cry out. For me that was the most painful scene of all because I know that's what people do. I see people kill a beast for the trophy. They take it home and hang it on the wall. The soul of that animal has been cast aside by a human, which has no soul. The beauty is not in the trophy. The beauty is in the life. The ending for the wolf represents the ending for the Sioux and all the other tribes that lost the natural way of life. Therefore I am just as disturbed for the Sioux as I am about the wolf. I am disturbed for the future of the Earth. 200 of 243 people found this review helpful. Was this review helpful to you?